I know that this is a step that a lot of people dread or even skip altogether, but making a muslin is the single best thing you can do to achieve dependable results when sewing. It seems tedious, but with a garment like Sorbetto, which you will want to make time and time again, making a muslin will be an hour well spent. That being said, this will seriously be the fastest test garment you have ever made. Staystitch the neckline on all versions, and the armholes for versions 1 and 2. This prevents stretching and gives you a sense of proportion of the bias binding. Start by cutting your muslin. Make sure to transfer all markings, including the notches, darts, and center front pleat. Stitch along the raw edge of the armhole with a 1/4″ seam allowance. We will skip the bias binding at this stage, but the stitching will give us an idea of the proportions. Next, sew the darts and center front pleat, per the pattern instructions. Press the darts down and the pleat flat. 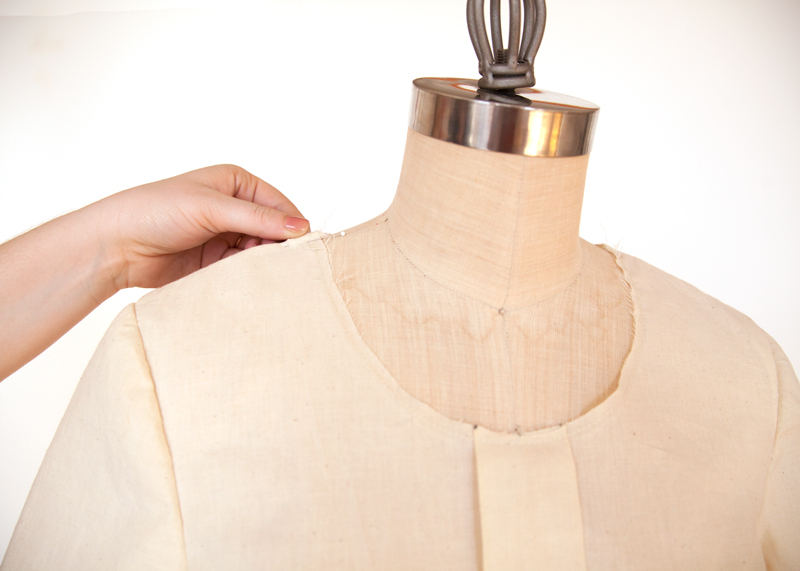 You can also stitch the pleat in place along the neckline and hemline to keep everything flat. Sew the shoulder and side seams. There is no need to finish the seam allowance, but you should press all seams for an accurate fit. If you are making version 3, insert the sleeve. This is not a place were we strive for sleeve perfection. If your sleeve cap isn’t perfectly eased, don’t sweat it. Staystitch the neckline, and the armholes (versions 1 and 2). Now we can try our muslins on and begin fitting. Take a look at the fit. Does the garment seem to be tight anywhere? Is it bulging, or producing loose wrinkles and folds of fabric? If it seems too big in any one spot, pinch out the excess fullness and pin it. Use a seam gauge or ruler to measure how much you need to remove from the pattern in that area, and transfer those markings to your pattern. If it seems too small in any particular area, slash the muslin! Pin some extra fabric behind the slash, and once you have it the way you want, measure the gap you’ve created. Now, once you have your muslin pinned to perfection, you can transfer your markings to your pattern. This week we will wrap up fit adjustments, with shoulder and sleeve adjustments on Wednesday. Then on Friday we will cover abdomen adjustments and moving the dart. I beat you to it and made a muslin over the weekend for this pattern. So worth the effort! I found that the size I’d thought best was too big all over, and even the next size down left me with too much armhole. I also goofed on the muslin and sewed the pleat backward (which I know is a variation, but not what I wanted) and as a result won’t have to learn that lesson on my chosen fabric. And as long as I was under the hood I gave the top a little waist line, and now I have a pattern I know I’ll use for at least three or four tops. Yay! Making a muslin is always worth the effort. I look forward to seeing your Sorbettos! Could you please help me understand what you mean by “Finish your seam allowance”? I see this on the instructions too. I understand we don’t need to do this step for the muslin but I’m confused what the step is, I’ve only ever pressed the seam allowance open. Hi Rebecca, a seam finish secures the raw edges of a seam to prevent fraying. The most common seam finishes in home sewing include a zigzag stitch, a serged edge, and a pinked edge. You can check out this guide for more examples. Hi there! I made my muslin in a size 6, already 1 size down from what my measurements would’ve gotten me into. It still appeared sacklike so I just started taking in side seams and ended up at 8cm less, which is a three-size difference. Now I know I like my tops not to be too loose and to be honest I went with size 6 just because I was not sure whether I’d still able to put it over my head. I have now traced a size 2 (the amount I took in would have gotten me into size 0 but again I wanted to be sure). However, this makes me fear another fit issue I often deal with (and was already showing when I made the size 6): front armholes being too tight. At the back I usually have some excess fabric and I know how to deal with that (take it out and transfer it to be a shoulder dart). On the front, however, I have the opposite problem nowhere to get the extra fabric from (in other words: no shoulder dart to close). For some patterns scooping out a bit of the arm hole helps, but not always: sometimes it just ends up looking funny. I have been looking for info on this but it appears to be quite a rare fitting issue as all sources I ever find only speak of the opposite problem. Do you have any light to shine on that? I’m no expert but it sounds like you have a narrow ribcage/back and full bust. Would an FBA in order? If that results in too much fabric maybe look at a narrow shoulder adjustment. It took me a while to figure out that I often need both for sleeveless top to work. In the end I drew a line from somewhere 1/3 into the armhole to the bust dart and took about 1cm out of there. Appears to have worked nicely. Maybe a bit of narrow shoulder would be in order too, FBA definitely not (although I wear a D cup I get no further than an A cup on the ‘sewing cup sizes’). My muslin fits almost perfectly if I pinch & pin the shoulder seams by ~1.5″. I’m a novice sewist & 1.5″ seems like a lot. Is this a common adjustment for petites or do you recommend another area to adjust (on the verge of needing an SBA)? Any favorite resources for petite adjustments? Thanks for teaching me how to sew! I cut the shoulder seams down by about that much, too. They were huge for me. Just keep messing with it until you like the fit. I made a second muslin once I’d made all the adjustments and redone the paper pattern (just to be extra sure before I started cutting good fabric), then used it as a lining for another sheer fabric Sorbetto. I made my muslin (sleeveless version) and it is huge. Falling off the shoulders, and so, so big the whole way down from there. I followed the measurements. I looked at ease. I checked the measurements against a similar top that fits. I am baffled, but here is my question — do I ditch this muslin and go for a smaller size (which appears to be two sizes down, except for the hips which will have to be graded up), or stick with this and fix it? I would need to take the shoulders up an inch, take 4″ in from the sides or front, and move the dart. The smaller size is on the other pattern, which I didn’t print, so I’d rather fix this one. Will you be covering the types of adjustments I’d need to make in order to make this top work for me? Thank you. I had the exact same problem but I thought I had messed something up even though I double checked everything. This is my first sewing project in a long time so I figured I was doing something wrong. According to my body measurements I am exactly a size 16, even though this is supposed to be a loose fitting garment the muslin I sewed is huge. I was thinking I would take the muslin apart and re-cut it for a smaller size and sew it up again? Because of the pullover design, Sorbetto has ample ease. If your personal preference is a more fitted look, I would recommend cutting the smaller size and grading up in the hips. I will be covering moving the dart on Friday so stay tuned for that adjustment. Thank you Haley. It wasn’t even close to fitting –that’s how big it was. But I am happy to say that I printed the smaller size range pattern, and cut out size 16 (two down from where the charts say I should be). I did add 5/8″ at the lower hip, and graded it out. Well — it’s PERFECT. Except the dart is a little long and pointy, so I have to make it shorter. But even the dart is in the right place. Doing a happy dance here! Doing a happy dance for you! Nailing fit is always worth celebrating! Well I’ve made my muslin of vs 3 in size 0, interestingly it gives approx the same fit as a muslin for Hayden in size 4, is this because of the new blocks? (it’s adding to my uncertainty of size choice). It is still a tad too wide in the upper body. I’m going to make and add the binding to the neck tomorrow to see if it makes a difference either way to the neckline, it is borderline too wide as is. The body fit is OK though. I sewed in both sleeves. In the sample photos the darts seem to be high, but with a bra on, the darts are below my bust (I’m almost 60 so this was a surprise!). The darts seem to be too long and low on me. My high bust is 30″ and bust 33″, I can’t go down a size so wondering if I need a SBA?? Is the latest Seamworks dress, (is it Sonya?) drafted with the new blocks? Hi Lynda, the differences you see between Hayden and Sorbetto can be attributed to two things: Hayden is designed with less ease than Sorbetto and the new block offers a different fit. Sonya is drafted using the update block also. It sounds like a size 0 without a bust adjustment was the correct choice. I am covering shoulder adjustments in today’s post, so that might be helpful. I will also cover raising and lowering the dart on Friday. Thank you heaps :) too much fabric and width above the bust is always a fit issue for me and solving that would make me so happy so I could finally move on and sew some dresses and tops. Made my muslin last night! The new fit is quite interesting. Based on the comments here and the size charts I made a size 0 as I like a snugger fit. I am not sure this was the right choice, so tonight I will try a size 2. The waist and hips were quite loose, too loose for me. But the shoulder and armhole area were tight and it pulls a bit across the high bust, almost like I need a shoulder or FBA? The sleeves and armhole were also too small for my arm, which was a bit of a surprise as I don’t have big arms. I am thinking this was because it was 2 sizes smaller then I normally wear. I am hoping going up one size will take care of the problem. I will just have to take the waist/hips in quite a bit. If that doesn’t work, I will try going back to my normal size and just taking it in like crazy! Hi Heide, it sounds like the tightness in the armhole and sleeve may be a result of sizing down. I think your instinct to size up is correct. Then after making your muslin, you can pinpoint the exact places you would like to remove extra ease. Hope this helps! Also wanted to add. I shortened my bust dart by 1/2″ as I always did that on the original Sorbetto too. Not sure it that is because I border on the petite side or if I am right on the edge of needing a FBA. LOL just looked up the price of muslin in my local shops – it’s dearer than most fabrics. and 3 times the price of the fabric I bought for this at $9/m. Oh well…. That’s nuts! Here in the SF Bay Area ($$$) I get it for $4.85 a yd full price for a nice quality cotton/poly muslin (the drape is closer to most fabrics I use, and I can use it as a lining in some tops vs. 100% cotton), and try to find it on sale where I can. You can definitely find it online for less, too. Kate, you can often get calico by the role quite cheaply in Spotlight. Hit them up when they’re having their sales. I use old sheets and doona covers from charity or resource shops for making muslins, afterwards my partner gets them for rags for use in his shed. Lynda – that’s a great idea, thank you!! Well, I thought my muslin was perfect, but realized that you can see a good bit of my bra under my arms, so I did yet another muslin, taking out about 3/8″ under the armhole. I also shortened the dart by about 3/4 inch. I just finished sewing, and once again everything is perfect — including the dart — except the armhole, which is still gaping. I just went in and tried to sew with a larger seam allowance at the armhole, and meeting up at the dart at the 5/8″ mark, but that didn’t work. Help! I won’t be able to wear this without more coverage under the arm. Hi Emm, it sounds like you could be experiencing one of two problems. 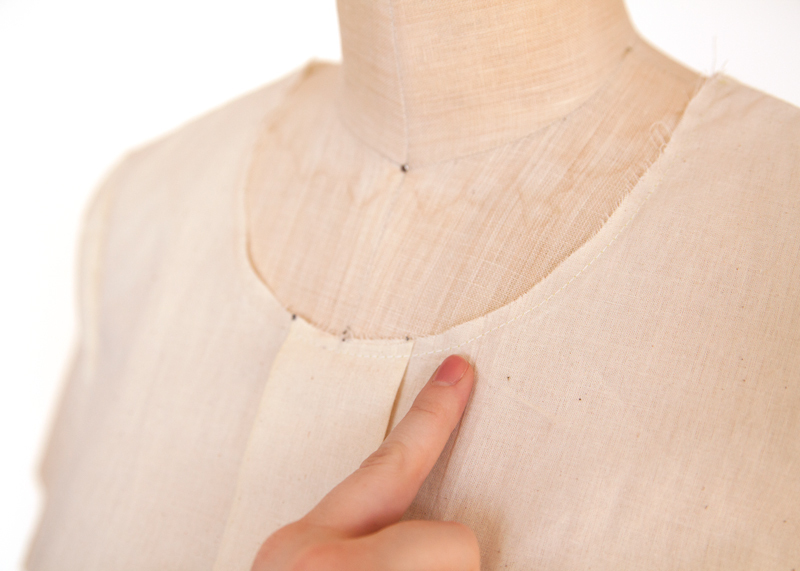 Your armhole could be too low, in which case you can raise the armhole. This article has some really helpful illustrations. If your armhole is gaping, you may need to rotate the excess into the bust dart. 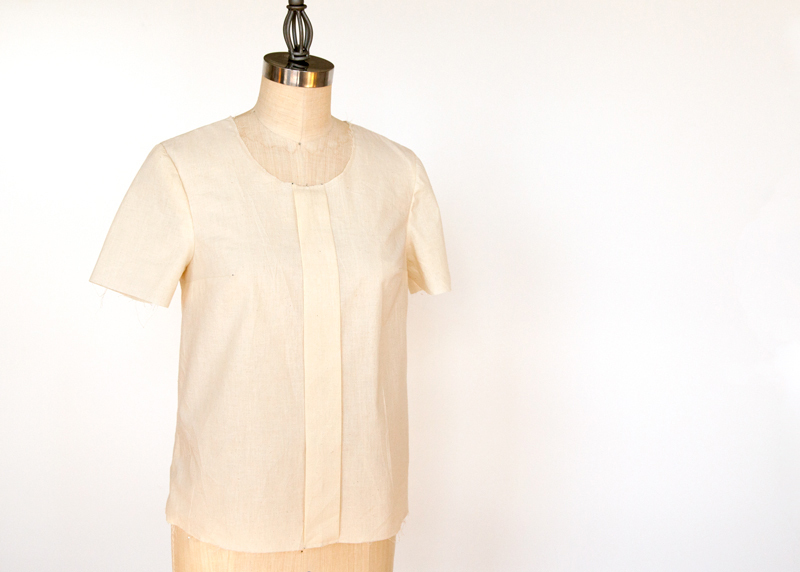 This Seamwork article has a helpful section at the end on how to make this adjustment. It’s not gaping in front — it’s too low (and a little too open at the back, but by a very small amount). Hope I don’t have to move my dart…it’s perfect where it is. 3 muslins (maybe 4) — is that a record? Will check this out and see if I can fix this. Thanks. I’m just confused and overwhelmed by what I’m reading. Musline #4. Still not really following everything in the links you provided, but I muddled through. I ended up doing a gaping sleeve adjustment, which moved/changed the dart. I tried adjusting the back gape, by moving the side seam, but that didn’t work. So I ended up redrawing the arm opening, adding 1/2″ to the bottom, front and back, and curving it to match up with the sides. I ran out of muslin fabric, so I ended up using an old (heavy) curtain (I feel like Julie Andrews in the Sound of Music), and just finished sewing it. The fit is now perfect — no gaping, no bra peeking out, fit great. The darts are still pointy, and I have to fix that before I wear it. Do you have any suggestions for that? Otherwise, I’m finally good to go. PHEW. Hi Emm, way to go! So glad you are getting the fit you want. Sometimes it takes a combination of a few techniques to get something totally custom. You could try shortening the dart a little (maybe a 1/2″ to an 1″) that might help. A pressing ham is also super helpful to smooth and contour your fabric. Luckily, neither of these tweaks will require another muslin. Happy sewing! I can’t wait to see your finished Sorbetto! I finally made my muslin and it’s comically huge! I put my faith in the pattern and cut the size that matched my measurements – a 6. When I made a size 6 with the old Sorbetto pattern and it worked out great with no adjustments necessary. This one is so big in every way and I can’t imagine anyone with the listed measurements would fit it–gaping armholes, bust dart completely under the bust. Not sure if I should trace a size 0 (which seems slightly bigger than my old size 6) or scrap the whole thing. If this is the way fit is going for Seamwork patterns this is very disappointing. Has anyone found the pattern true to measurements? I’ve never bothered to make a mulsin before; which is probably why I’ve never successfully made a garment to wear outside the house! I made my very first muslin with the sorbetto pattern and now I see why it adds value. I have no emotional attachment to the fabric and now I see clearly that I need to adjust my dart up 3/4″ but that I didn’t need to add length (I’d expected to need to) and that my little work around to do the back in two pieces (1 1/2 yd isn’t enough for a size 14 if it’s not cut generously at the store, I was shy 1″ cutting out) worked out just fine.